Getting people to your website is not an easy thing to do and getting them to become a paying customer is even more difficult. Here are some reasons why websites, don’t generate sales. time. Listed below are some of the main reasons why potential customers may be driven away from your site, thus preventing you from making a sale. A site that is confusing is guaranteed to lose customers. Visitors come to your site looking for something, not to become confused. They expect to easily navigate within your site, and if they are unable to do so, the get irritated and leave. Layout and clarity are important. Keep your site clean, clear, and focused. Your site reflects your business image. 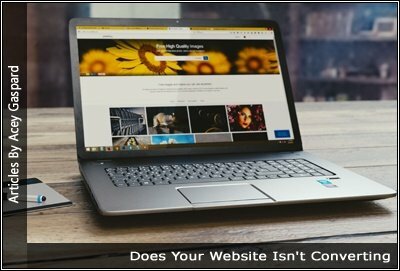 If your site looks like it was built by an amateur, your potential customer will be left with the impression that your business is unprofessional. Credibility is not easily achievable, yet it is a significant part of the sales process. On the web, it’s hard to gain credibility, because there is no face-to-face contact. Trust is earned with time. When someone enters your site for the first time, you don’t have the opportunity to establish a trusting relationship; therefore it is essential to have a professional site that includes all your company’s information. Also, be sure to offer a believable, clear message and a strong guarantee. It is imperative that you eliminate any risk that the customer may perceive. Visitors have to understand what your site is about in a matter of seconds. How many sites have you visited that have left you unsure of their purpose? Did you spend time trying to figure out what the intent of website owner was, or did you simply leave? Keep your site focused, and simple. People will appreciate it and this will remove another barrier of the buying process. If someone can’t find a product, price, or the order page on your website, you have a problem. Make it easy for your visitor to make a purchase. One problem I have run into was a site that didn’t accept my information at the check out, because of some program error. It’s a good idea to test your site and each option on your checkout page beforehand to avoid situations such as these. Another problem worth mentioning is having too many options at the checkout. If you are trying to upsell, do so before the checkout, not during. People may get confused and frustrated about the difference between the standard product and the upsell product and may leave without making a purchase. If you don’t ask for the order, you are losing sales. A lot of people will be interested in your product, but if there is no call to action, people will do nothing or, think they will make a purchase later and then forget to do so. You have to close the sale when they are at their peak interest. It doesn’t matter how good your website, product, service, or price is, and it doesn’t matter if you’re giving away water to a thirsty population; If your site has little to no traffic, you won’t be making sales! You have to drive targeted traffic to your site in order to make sales. If you think your products or services are suited to everyone, you are making a huge mistake. The more specific you are in defining your audience, the more you can understand them and adapt your business to address their needs and desires. For example, if you’re selling baby products and your audience is comprised of senior citizens, how many sales would you make? If your audience is the wrong match for your product or service, it doesn’t matter if you give it away because they won’t be interested. For best results, your targeted audience must have a desire for your product, and the ability to buy it. All of the above contribute to a website that won’t make the sale. But if you have the right product at the right price, and it’s targeted at the right audience, you have won half the battle. Make your offer so compelling that buyers are literally reaching in their pocket for their credit card. If you want to see some excellent examples of this technique, watch a few infomercials. They are masters at putting together packages that are irresistible. Using the above as a guide when creating or remodeling your website will help you optimize it and increase online sales. You can then focus your energy on implementing marketing strategies to increase your success even more.